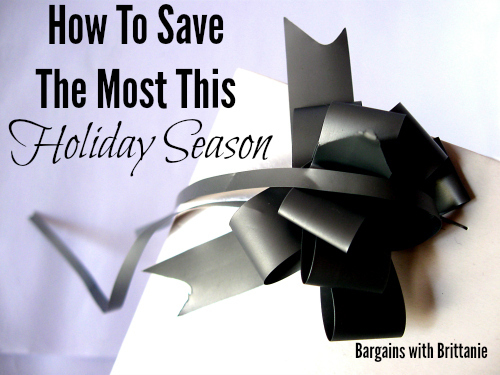 How to Save The Most This Holiday Season! It’s no secret the holidays are approaching fast. In fact, as of today there are only 75 days left which is crazy to me. With all the changes Facebook has made (and continually makes) I wanted to share with you some ways on How to Save the Most this Holiday Season. If you can commit to doing the things I mention below I can guarantee you will save a ton on your holiday shopping and may even get it all done early. Bookmark the Site– I cannot stress this enough. The best way to ensure you are staying on top of the deals is to check this site directly. Emails get lost, Facebook posts go unseen, so check this directly and multiple times a day. Make sure you are also using the “more posts” button at the bottom to sort through pages. Sign-up for Email Updates– Once a day an email goes out to those who are subscribed. The email contains that days posts which is a great way to make sure you don’t miss anything. I will also be doing some sort of giveaway during the holidays exclusively to those who are signed up so make sure to join. You can join at the top of the site. Join the Bargains with Brittanie Christmas Deal Group– Groups are easier to see posts because you will receive alerts each time something is posted in there. It’s a great little community. I do want to mention that this feature might be taken away since Facebook has been deleting groups to try to make pages pay to advertise posts but for now this is a great resource. Follow me on social media– This is a biggie. I post everything on social media and I am on all the major channels so follow me on them all so you have access to the latest and greatest. You can find me by using the buttons on the top of my site or I’ve provided direct links for you below. Instagram is a great one because I will post deals I find while I am out and about shopping this holiday season. Reach out to other Readers- In groups and on my page feel free to tag family and friends and interact with other readers. Remember they are here for the same reason you are- to save money! Use them to answer questions or get advice. There are several of you that are really great about sharing content and interacting and I truly appreciate the support and help! I wanted to give that it’s own header because you are going to notice me posting a ton of Amazon deals. Why? Because they typically have the best prices on everything and the ability to shop from home and save is amazing! Make sure you sign-up for your free Amazon Prime Membership trial so you will get free 2-day shipping through the holidays. You can join by using the banner below. Well I think that pretty much covers it. I know this might be a bit long and a lot of information to take in but doing little things like this can be the way to stay within your budget when holiday shopping. I hope I can help you all save a ton and look forward to all the madness to come! Are you ready for all this madness? I know I am!